Meghan has rescued her kidnapped younger brother from the land of Faery, but now it is time for her to repay the debt she owes to the Winter prince, Ash. She has to accompany him back to the Winter Court, where, as a daughter of the Summer King, Oberon, she is surrounded by faeries who despise her. Summer and Winter are inching ever closer to war, but it’s a new threat from the Iron fey that poses the greatest danger. Meghan must rely on allies with questionable loyalties as she tries to convince the Courts to stop fighting with each other and instead unite against their common enemy. The Iron King was one of the first books that I reviewed, and looking back on it, I think I tried a little too hard to love it as much as so many other readers do. I still really like the world and how incredibly imaginative it is, but the characters came up short for me this time in The Iron Daughter, especially Meghan. She seemed like a stranger compared to the determined young woman who set out to save her brother in The Iron King. 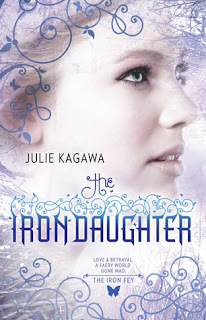 I found myself willing her to pull herself together for a good deal of The Iron Daughter, and it didn’t quite work. I had pretty high expectations going into this book, with Meghan having to uphold her end of the contract she made with Ash when she was trying to find her brother. Meghan has to go to the Winter Court, where she can expect nonstop withering glares from its queen, Mab. I was intrigued to see what else awaited Meghan in such a hostile environment but was disappointed that 1) she didn’t spend as much time as I’d thought she would there, and 2) most of that time, and most of the book, was spent moping over/pining for Ash. Ash won’t look at her. Ash is avoiding her. Ash doesn’t love her. As I said before, the girl who faced the Iron King has gone missing; in her place is this whiny Meghan who’s completely dependent on a guy whom I feel I still barely know, even after two books. I admit that I found Ash’s broody demeanor kind of cool (no Winter prince pun intended) in the first book, but at this point, I’d like to see that there’s more to his character than intense stares and brandishing a sword every once in a while. The pacing of the book also felt a little off to me. There’s the main story line revolving around the Iron fey’s latest scheme, but to me, it sometimes got lost amid the multiple subplots. The story really dragged once Meghan and crew found themselves in the Between, the realm in the middle of the mortal and faery worlds and the domain of Leanansidhe, the self-styled queen of the faery exiles. I didn’t think that Meghan and her companions were ever going to leave this place, and I was very happy when they finally hit the road. The talking cat, Grimalkin, has become my favorite character because he’s truly the voice of reason. He doesn’t mince words and points out all of the other characters’ blunders, often voicing my own opinions of their actions. I find Grim very entertaining, and his wry observations were definitely the highlight of this book. The Iron Daughter has some solid elements to it, the strongest by far being its whimsical world where anything is possible, but they just didn’t combine into a story that gripped my interest. With this being the second book in the series, I also needed to see the characters continue to develop, but they were pretty much the same ones I met in the first book, except for Meghan, whose character takes some steps backwards here. Still, there’s a charm to this series that appeals to me, and I do enjoy Grim’s sarcasm. I didn’t find this as enchanting as The Iron King, primarily because of how Meghan goes to pieces over Ash. Definitely not what I like to see in a heroine. First of all great review! I think the first two books in this series are just 3 star books. Even though I really love this series, all the first two had going for them is the World. However, the third book is so much better then them, so much. Meghan gets a lot stranger and we get to know Ash better. I would say keep going on the series, because, in my mind, The Third one is the best. Meghan is definitely a stronger protagonist in book 3. If I hadn't borrowed both this and The Iron Queen from the library at the same time, it probably would have taken me forever to finish the series because Meghan really got on my nerves in The Iron Daughter. This was definitely my least favorite out of the series, and I agree that the books got better afterwards. Grim's dry sarcasm really saved this one for me.